Contoured shape encourages correct ergonomic position while placing hands in neutral posture. Patented Health-VTM Channel reduces wrist pressure to help prevent carpal tunnel syndrome. Self-adjusting gel provides comfortable support. Microban® Antimicrobial protection helps keep palm rest cleaner. 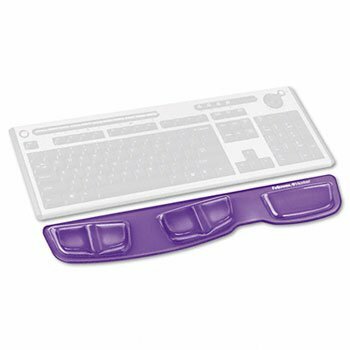 Ergonomic: N/A; Global Product Type: Mouse Pads & Wrist Rests-Keyboard Wrist Rest; Wrist Filling Material: Gel; Mouse Pad/Wrist Rest Type: Keyboard Wrist Rest. If you have any questions about this product by Fellow, contact us by completing and submitting the form below. If you are looking for a specif part number, please include it with your message. Z ZTDM 5 IN 1 Digital Heat Press Transfer Sublimation Multifunction Machine,Rhinestone/T-Shirt/Hat/Mug/Plate/Cap Mouse Pads Jigsaw Puzzles DIY, Swing Curved Element w/ Dual LCD Timer 12"x15"